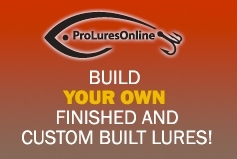 In addition to the many both wooden and plastic unpainted lure bodies that LurePartsOnline.com already offers lure makers; there are now 6 great new ones. Paint your own custom colors and save big on these top quality plastic lure blanks. Choose from a variety of popular styles. Once painted, just add hooks and they are ready to fish. These bodies are premium quality and swim true. Sold per each. Lure Hardware and Hooks and Eyes to finish off the lures.